Kevin Giffin @ http://www.summernanny.com writes HOW TO SHOP FOR SCHOOL CLOTHES ON A BUDGET – Shopping for school clothes doesn’t have to sink you into debt. Your kids can wear trendy and unique outfits on a budget, as long as you’re willing to work at finding them. Sean @ One Smart Dollar writes What Exactly Are Austerity Measures? – Most of us hear the phrase austerity measures on the news but a lot of people don’t understand what they are talking about. Here is the lowdown. md @ Start Freelancing Now writes Freaking Crucial Tools That Every Freelancer Needs to Make Money & Stay Focused – Tools that will help you focus and make money. Wayne @ Young Family Finance writes How to Remotely Incorporate Your Ecommerce Business in Canada – There are many excellent reasons for incorporating your ecommerce business in Canada. Incorporating your ecommerce business in Canada may be a great idea if your business has substantial connections and contacts with Canada, even though you personally reside and work in a different country. Scott Skyles @ Mortgage1a.com writes Paying Off Your Mortgage before Settling Into Retirement – While extending the loan in order to make smaller monthly payments is definitely helpful in some aspects, carrying this debt into retirement can lead to additional financial stress. Robert @ The College Investor writes The Differences Between American and Canadian Credit Cards – You may think that all credits cards – both in the United States and Canada – are very similar, if not the same. I mean a credit card is a credit card, right? But, in fact, our neighbors to the north have some key differences when it comes to their cards. GD @ OneCentAtATime.com writes Cosigning A Student Loan – For Parents – There are many factors to consider before a parent cosigns a student loan. Here is an in-depth look at what families should consider before cosigning any loan, including student loans, and how to find alternatives. Jon Haver @ Pay My Student Loans writes 6 Depressing Facts About Student Loans – With steady and gainful employment becoming relatively scarce and the United States population increasing, more people are having to make tough choices. Many are having to decide between becoming indebted while trying to make a living without a college education, or becoming indebted by taking out one or more student loans in hopes of pursuing a profitable career by earning a college diploma. Jason Hull @ Hull Financial Planning writes You Could Become the Next Big Thing – This article explains the “rookie fallacy” and how you can leverage this psychological bias to advance your career. LaTisha @ Young Finances writes 5 Interview Tips for Recent College Graduates – When you’re going on an interview you need to be prepared. Why should we hire you?” These are questions that you should expect to hear on your interview. krantcents @ KrantCents writes Road Map to Success – A Personal Story – Writing about success reminds me of the interview question tell me about yourself? If you are not familiar with this question, it is an interviewer’s question to get the candidate to start talking. Some call it a 60 second commercial! It is supposed to focus on the skills you bring to the job. Grayson @ Debt RoundUp writes Too Focused on Money and Losing Focus on Enjoyment? – Everything that I do has been focused on building my wealth and getting on track for retirement. I have been so focused on making more money, saving money, and getting on track that I have forgot to focus on things that I enjoy. I have kept a sharp eye on finances and got blurry vision on my hobbies. I need to get back on track and open my eyes completely. I need to refocus my energy toward my hobbies. Are we too driven by money? Jules Wilson @ Faithful With a Few writes I Hate To Say This, But I Was Saved By A CREDIT CARD!!! – Normally, I don’t like to be put in a position to have to place an expense (or multiple expenses as in this case) on a credit card, especially since we already have a ton of debt, but in this case it seemed to be our best option. Jacob @ My Personal Finance Journey @ My Personal Finance Journey writes Barclaycard Rewards MasterCard vs. Chase Freedom Visa – Credit Card Boxing Series – Match # 2 – This post compares two general purpose credit cards– Barclaycard Rewards MasterCard and Chase Freedom Visa Card; and determines which (if either) of these cards are appropriate for your financial situation. Jacob @ AllPersonalFinance writes Where to Find Fast Cash Loans in California – Payday loans are the fastest ways to get the money you need to bridge the gap between paydays, but when it comes to shopping around for fast cash loans, many people would like to go directly to a physical location and make sure that everything about the lender is exactly as he or she was told. Little House @ Little House in the Valley writes Credit Card Debt Consolidation Facts – According to the Federal Reserve, in 2012 the average household carried just under $16,000 in credit card debt and approximately 56% of them had trouble making their monthly credit card payments. Credit card debt consolidation is one of many options to examine in your quest to reduce your credit card debt. KK @ Student Debt Survivor writes I’m Dating a Financial Stud – Is your partner financially responsible or a financial flop? Keep reading to find out why I think my boyfriend is a financial stud. Jon @ Novel Investor writes Best Investment Books Every Investor Must Read – The best investment books are timeless. All the books in this list will act as an introduction and reference for improving your investing knowledge. Roger Wohlner @ The Chicago Financial Planner writes 3 More Financial Products to Consider Avoiding – Earlier this year I wrote 3 Financial Products to Consider Avoiding. This was not intended to be a complete list so here are three more financial products to consider avoiding. Green Panda @ Green Panda Treehouse writes Are You Comfortable With Banking? – Not everyone is alright with how they manage their money yet. Div Guy @ The Dividend Guy Blog writes The Sector that Will Beat the Market in 2013 – Where should you be investing? Luke @ Learn Bonds writes Are High Yield Bank Loans Better Than High Yield Bonds? – Fear of inflation and rising interest rates have prompted tremendous interest in mutual funds and closed end funds that invest in high yield bank loans. Mike @ Personal Finance Journey writes 10 simple things you should ask before Forex Trading – The easiest and most obvious questions you should ask before jumping into forex trading. Don @ MoneySmartGuides writes Getting Started in Forex Trading – As my readers of my blog know, I am all about passive investing. When it comes to putting money away for the long-term, a good plan is needed that included low cost investments. Hank @ Money Q&A writes How Behavioral Finance Biases Can Cost You Money – Many of you may not have heard of the term behavioral finance biases, but it is hard to find a point where our minds do not get in the way of our money. It happens all the time. Maria @ The Money Principle writes What do you do about saving these days? – The Money Principle – What do you do about saving these days?As regular readers will know, we are looking to build an investment portfolio and are therefore becoming interested in the science and practice of storing money – that is, investing. So let me dream for a little, imagine that we have already amassed a stash and want to put it away safely and securely. Steven @ MyDividendStocks writes Why ETF Dividend Stocks – An Exchange Traded Fund (ETF) is a type of investment instrument which is traded in stock markets like a stock. However, unlike a stock, an ETF is a mutual fund and therefore it owns other stocks on behalf of its subscribers or owners. A Dividend ETF is a type of ETF that specializes in investing in stocks that pay a higher rate of dividend. Michael Kitces @ Nerd’s Eye View writes Asset Location: The New Wealth Management Value-Add For Optimal Portfolio Design? – While most investors are familiar with the principle of asset allocation, the new frontier in creating more wealth in portfolios is now asset location – once you own a diversified portfolio of investments, in which (types) of accounts will you put those assets!? Jon the Saver @ Free Money Wisdom writes How To Successfully Barter Your Services – Use these strategies to successfully barter your services and make the most amount of money possible. Super Saver @ My Wealth Builder writes Profit Averaging Selling – One strategy that I learned from an stock trader is to sell partial positions when a stock reaches a near term sell price. That way if the stock price continues to rise, I will continue to participate in the gains. If the stock price declines, I will have taken some profit at a higher price. A Blinkin @ Funancials writes What Does Ben Bernanke Think About The Economy? – Ben Bernanke appeared on TV to answer questions from the Senate Banking Committee. Specifically, he defended the on-going asset purchases of $85 Billion/month the Federal Reserve is making in order to “support our recovery.” He reassured the general public that the benefits outweigh the potential risks. Tushar @ Start Investing Money writes How Often Do You Review Your Investment Plans? – This Post was Originally published at How Often Do You Review Your Investment Plans? on Start Investing MoneyWe all know how important it is to invest in our futures. For some this may mean investing in new skills so we can earn more money. For others it may mean searching for stocks and bonds that seem likely to bring in the best returns. Suba @ Broke Professionals writes My European Vacation: Budgeting for the Trip – I’m budgeting for my European vacation, but learning that a nonstop flight to London may be a luxury I can’t afford. Roger the Amateur Financier @ The Amateur Financier writes Net Worth Update: March 2013 – Well, another month has come and gone by so fast it barely seems to have arrived as all. Tony @ We Only Do This Once writes A Beautiful Story About Following Your Passion – For as long as I can remember, I’ve wanted to be a professional musician. I began my quest hoping beyond hope that my desire alone would be enough to magically propel me to stardom. I soon learned that there are no shortcuts to success, no magic wands to wave; and that my desire was just the tip of the iceberg of what was actually needed. JC @ Passive Income Pursuit writes What is Margin? – Ever wonder how exactly margin works? If you’re interested in learning more check out the primer explaining margin, the benefits and disadvantages, and how I plan to incorporate margin in building my portfolio. Ray @ Squirrelers writes Is it Dangerous to Become Complacent in a Bull Market? – Everybody enjoys prosperity, and healthy investment returns. That being said, when things are good for an extended period of time, is that a time to start getting cautious? Roger Wohlner @ The Chicago Financial Planner writes Investment Diversification – A Look at the Basics – Investment Diversification is one of the basic tools of building a sound investment portfolio. Diversification is the fancy name for the advice your mother might have given you: Don’t put all of your eggs in one basket. This is the basic tenant behind asset allocation, a key diversification tool. Lance @ Money Life and More writes USAA Car Insurance and USAA Bank – Great Products I Use – I’ve only used one car insurance company in my entire life because they are incredibly awesome. That company is USAA. They are amazing in my book. Their rates are the lowest rates I have ever been quoted by any company and I’ve never had any problems with them whatsoever. harry campbell @ Your PF Pro writes Should I Buy a House Now While Interest Rates are Still Low? – Over the past few years, many articles I’ve read have repeated the same mantra: “Now is the time to buy real estate.” Interest rates were low and they couldn’t go any lower, whoops, they did. Since purchasing my condo in 2010, I’ve re-financed twice due to mortgage interest rates dropping and although we’re getting closer to 0% than where rates were at 5 years ago, I don’t see any big turnaround in sight. Philip @ PT Money writes Tax Calendar and Last Day to file Taxes in 2013 – It’s that dreaded time of the year, and it’s vital to know your deadlines, whether your an individual or a corporation. Jester @ The Ultimate Juggle writes To Save Big For Retirement Or Not – Read why I’m starting to really question my current decision to max out retirement savings. Perhaps there is a more balance approach! Lauren @ L Bee and the Money Tree writes To Coupon or Not To Coupon – Do you coupon? Here are my reasons both for and against couponing. MMD @ My Money Design writes Finally a Safe Savings Rate for Your Retirement Formula – We’ve all seen articles that say to save 10%, but how do we know that percentage is really the right number to plug into our personal retirement formula? Thanks for hosting and for including my post. It is much appreciated. 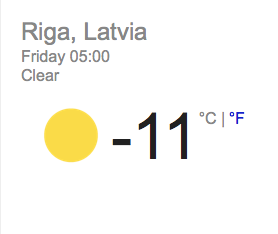 Have fun in Riga! Thanks for hosting and choosing my article! Write in advance, nearly fell off my chair then! Have a good one Savvy, about the same temperature as the UK then. What a long carnival. Thanks for putting that together! Thanks for hosting and for including my post. Enjoy your trip. Thanks for hosting and for including me. I appreciate it!